While the overall quality standard for white Rhône Valley wines has been steadily rising in recent years, none of the region’s other appellations can approach Châteauneuf-du-Pape’s rapid expansion of high-quality, even world-class bottlings. Wine lovers who understandably threw in the towel on these wines as recently as a decade ago, fed up with blowing good money on dull, alcoholic, often oxidized wines, owe it to themselves to dip their toes back into the water. I’m confident that you will be very pleasantly surprised and perhaps even thrilled by the category’s quality turnaround. While white wines represent only 7% of Châteauneuf-du-Pape’s total production, don’t think for a minute that most of today’s producers treat them as afterthoughts. In fact, it’s the rare estate here that doesn’t produce at least one Châteauneuf blanc, and every year more producers expand their line-ups to include bottlings from old vines, single varieties and/or single sites. These new special cuvées are often done to dazzling effect—and frequently without the full Monty of new oak, lees stirring and amped-up ripeness that too often marks high-end, limited-production white wines from around the world. But an afterthought is very much what the white wines were here for most wineries though the end of the 20th century. The grapes were often harvested too late, in many cases even after the red grapes had been picked. Pressing was done aggressively, in many cases as vigorously as for red wines, while the wines often languished in tanks with no temperature control or topping-up. Compounding these errors, wineries often bottled their whites too late, at the cost of whatever freshness they might have once had. These issues have now been addressed by all but a handful of wineries in the area. Of course there were exceptions, notably at Château de Beaucastel, especially with their Roussanne Vieilles Vignes bottling, but they were few and far between, not to mention predictably expensive. In fact, many humble Côtes-du-Rhône whites, which were bottled quickly for cash flow purposes, were simply fresher and better than many Châteauneuf blancs. A similar situation existed in Bordeaux through the early 1980s, when most of that region’s wines—aside from Châteaux Haut-Brion, La Mission Haut-Brion and Domaine de Chevalier—were thin, hard-edged and generally innocuous also-rans. That is, until a handful of producers in the Graves area adopted more serious farming and winemaking regimens that brought about a sea change in the quality and reputation of these wines. 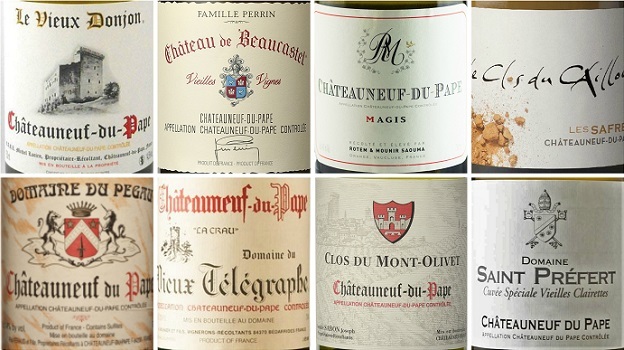 I’m confident that the category of white Châteauneuf-du-Pape will soon be recognized by the market for its quality, given the sheer number of excellent wines that have emerged here since 2010. One of the strongest forces for livelier wines has been the increasing popularity of the Clairette variety in the region. This local grape and its rarely seen sibling Clairette Rose are now being harvested on the early side for freshness and acid retention. Wines whose blends are based heavily on this variety typically show vibrant citrus fruit, floral and mineral elements, and the backbone to age. Grenache Blanc, which originated in Spain’s Catalonia region, and Roussanne, a transplant from the northern Rhône, are usually picked on the riper side and yield richer wines with pit fruit and more exotic tropical character. With the addition of Clairette, these wines now have vivacity to go with their power; they offer immediate appeal but also have more capacity to age. Bourboulenc, a late-ripening variety, is also popular as a blending grape but it plays nowhere near as important a role in the region as the other three varieties do. The other white grapes that grow here—Picardin and Picpoul—make only rare appearances, and minuscule ones at that, in most white Châteauneufs. Most of the wines reviewed in this article were tasted during my visit to the southern Rhône in late February; I also tried a handful of additional examples upon my return to New York.